Now THIS is local food. My co-worker raises hens - in the city. 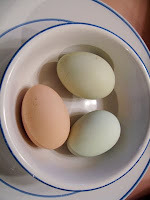 Lucky for me and other fortunate office-mates , she brought some eggs from her backyard hens. The eggs were delicious - bright orange yolks and very fresh. Plus - such pretty colors! Interested in raising hens? There are lots of on-line resources for raising hens, and co-ops hold seminars to get more in-depth urban chicken information. Did you know? Martha Stewart has been raising hens for a long time! I've had pomegranate juice before, but never with the much touted acai berry. The Lakewood Pomegranate with Acai juice was an impulse buy from my local co-op. Positioned on the end cap, ripe for impulse buying. It's organic, lots of vitamin C, has anti-oxidants, and it's 100% juice. It even has Omega oils. That's a lot for one modest size bottle of juice. The taste is sweet and a little tart. The texture - full bodied and thick. A great impulse buy. Amazon sells a 6 pack case if you're really into it.